Go Home Bay, Georgian Bay, Ont. Credit: Frank W. Micklethwaite/Library and Archives Canada/PA-068493. Editor’s note: This is the fourth in a series of posts considering the intersection between environmental history and the histories of science, technology, and medicine. Previous posts can be found here. Stephen Bocking’s blog post “Landscapes of Science,” published here some months ago, proposes areas for further research into the environmental history of science in Canada. These include science’s material culture and historical geography, and its relation to Indigenous knowledge. In this post, I suggest a site where these approaches could be usefully tested, and briefly sketch its history. It is a site that has previously escaped scholarly attention—Canada’s first freshwater research laboratory, the Go Home Bay Biological Station. The station was established in 1901 by University of Toronto (UT) professors, who built it on the grounds of their private summer resort, the Madawaska Club. 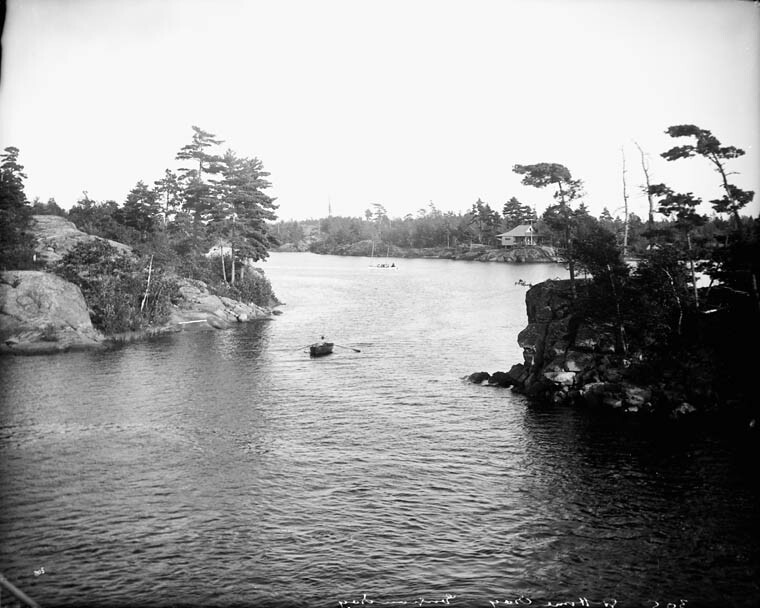 The club was founded in 1898, when UT professors, including biologist Ramsay Wright, had come together to alienate some 1,600 acres of rocky land and islands around Go Home Bay in Ontario’s Georgian Bay. The club’s charter restricted membership to UT members; it also specified that the club was “to conduct experimental work in Forestry, Biology and other branches of Natural Science.” By 1905, the station consisted of a laboratory building, boathouse, and house to accommodate workers and visiting researchers. Summer days in Go Home Bay. Credit: J.W. Bald/Library and Archives Canada/PA-029360. Originally a private laboratory, the Go Home Bay station was incorporated into Canada’s fledgling system of marine research stations, which Jennifer Hubbard describes in A Science on the Scales. Like marine biological stations, which were first established in Europe and the United States in the 1860s and 1870s, the Go Home Bay station enabled researchers to study aquatic organisms, and their environments and interactions, in place. Researchers were mostly men from UT, but did include some women and international scientists, such as Norwegian biologist G.O. Sars, who discovered that cod eggs drifted on oceanic currents. The federal fisheries department published a volume of station research in 1915, the year after the station closed. The papers examined Georgian Bay’s aquatic and botanical life, and included a systematic list of fish and more tightly focused studies of Go Home Bay’s insect populations. When this rugged and wind-swept site was first occupied, members camped and ate communally. Over time, the club (which still exists) became an enclave of private cottages, and cottagers enjoyed community picnics, regattas, and church services through the summer months. That the biological station was embedded in a summer resort is not surprising. Both Phillip Pauly and Helen Rozwadowski have written about “resort science” in the United States. Marine research stations, located at genteel resorts, helped foster professional scientific communities that defined biology as a discipline—and who was qualified to practice it. Recreation, like work, is another mode through which one comes to know nature, a sort of field practice. And natural history practices, especially field collecting, blurred any sharp distinctions between science and recreation. Research stations allowed scientists to escape hot noisome cities in the summer, and pursue their work and leisure at once. Go Home Bay, Georgian Bay, Ontario. Credit: William James Topley/Library and Archives Canada/PA-008551. The Go Home Biological Station offers opportunities to connect science, recreation, place, and privilege in finer-grained detail. The station’s placement within the late nineteenth-century colonization of Georgian Bay as a settlers’ summer place (documented in Claire Campbell’s Shaped by the West Wind) bears closer examination, for example. Treaties in the 1850s dispossessed the Chippewa of large parts of Georgian Bay, leaving them with a patchwork of small reserves, including the “Christian Islands” near Midland. These islands now constitute the present-day Beausoleil First Nation. As part of the Madawaska Club, the Go Home Bay station sat on land purchased from the Department of Indian Affairs (DIA). The department, ostensibly acting on behalf of the Chippewa people, surveyed, numbered, and auctioned off the Bay’s complex coastline and its thousands of islands, some barely large enough for a cottage. 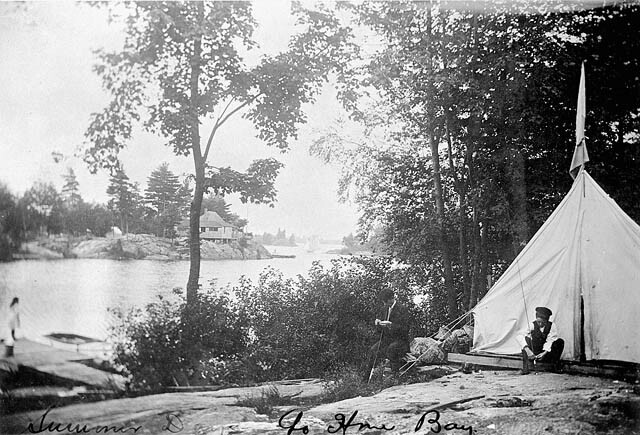 Yet as a club publication shows, the Chippewa continued to use Go Home Bay, as they had in the past, as a camp for seasonal blueberry picking. “The Indians,” a club book recounts, “…were in general very welcome with their baskets and mats as a picturesque and vivid reminder of a vanished era” (28). But club members eventually became annoyed with the Chippewa’s annual visits to their newly privatized property and asked the DIA to intervene. Duncan Campbell Scott, DIA’s deputy minister, complied and wrote the Christian Island band in 1915, demanding that its members stop visiting Go Home Bay. This act “settled” the problem in the cottagers’ favour. Another question is how the station’s research may have shaped, or been shaped by, other aspects of this dispossession. A charter member, physicist W.J. Loudon, was a keen angler and had successfully petitioned the Canadian government in 1903 to fund the station. Loudon proposed that the station study one particular fish, the small-mouthed black bass (Micropterus dolomieu). A North American fish categorized by sportsmen as “game,” the bass loomed large in debates about freshwater fishing regulations in nineteenth-century Ontario. Although reserved in regulation for sportsmen, bass continued to be fished for commercial and subsistence purposes. As a famous “haunt” of the black bass, Georgian Bay was a locus for contests about this fish: anglers, including those from Go Home Bay, blamed unrestrained commercial and Native fisheries for declining fish. Commercial fishermen bit back, and accused sportsmen of leaving bass to rot on shorelines, stringers, and docks. Further research into the Go Home Bay Biological Station might illuminate the growing convergence between sport fisheries interests and science in the early twentieth century. One link exists in the person of B.A. Bensley, the station’s director for most of its existence, who went on to direct the Ontario Fisheries Research Laboratory at the University of Toronto. The laboratory expanded freshwater fisheries science in the province and, as Stephen Bocking has shown, established the grounds for closer collaboration between scientific researchers and government fisheries managers after the Second World War. This project has lain dormant for some time, until Stephen’s post reminded me of Go Home Bay. Thinking about landscapes of science helps to ground accounts of scientific activity in specific locales, among specific communities, and with competing interests—reminding us that science takes place to happen. My thanks to Anne Riitta Janhunen for sources on nineteenth-century land surrenders in Georgian Bay. William Knight is curator of agriculture, food, and fisheries at the Canada Science and Technology Museums Corporation in Ottawa. He wrote his dissertation on the Canadian Fisheries Museum. The club originally planned to purchase property where the Madawaska River flowed into Rock Lake, which today lies within Algonquin Park. They were opposed by logging companies and turned to Georgian Bay. The club’s name thus retains a trace of their first plan. This quote, and others in this post, are from a privately printed book of 56 pages, The Madawaska Club: Go-Home Bay 1898-1923, 34. W.J. Loudon, The small-mouthed bass (Toronto: Hunter & Rose, 1910), 88. Stephen Bocking. Ecologists and Environmental Politics: A History of Contemporary Ecology. New Haven: Yale University Press, 1997. Jennifer Hubbard. A Science on the Scales: The Rise of Canadian Atlantic Fisheries Biology, 1898-1939. Toronto: University of Toronto Press, 2006. W.J. Loudon, The small-mouthed bass. Toronto: The Hunter-Rose Co., 1910. Phillip J. Pauly. “Summer Resort and Scientific Discipline: Woods Hole and the Structure of American Biology, 1882-1925.” The American Development of Biology. Edited by Ronald Rainger, Keith Benson, Jane Maienschein. Philadelphia: University of Pennsylvania Press, 1988. Helen Rozwadowski. “Playing By—and On and Under—the Sea: The Importance of Play for Knowing the Ocean.” Knowing Global Environments: New Historical Perspectives on the Field Sciences. Edited by Jeremy Vetter. New Brunswick: Rutgers University Press, 2011. Curator at Canada Science and Technology Museums Corp.
Landscapes of Science: The E-book! Thanks for this terrific article. I continue to be impressed with the posts in this series. Obviously, there is a lot of good work to be done in the environmental history of science. I had a couple of thoughts. First, Stephen Bocking’s first post and now your post remind me a lot of the approach Mark Fiege takes to his chapter on the atomic bomb in The Republic of Nature. In particular, you both highlight the connections between recreation and scientific study. On that point, I also wondered what other environmental historians might be able to add to this case study of Go Home Bay. In particular, I’d like to hear from Claire Campbell, Andrew Watson, and Jess Dunkin. I’ll reach out to them on Twitter and see if they have anything to add. Oh, heavens, Sean, the pressure. Hi, Will. But it’s a good reminder of the class/race privilege that restricted/s access to certain networks, professions, and institutions as well as to certain geographies and activities within nature. It occurs to me that this is the kind of thing that helps Go-Home specifically and the Georgian Bay more generally cast itself as a more “authentic” outdoor experience compared to the materialism and sociability of the Muskokas [sorry, Andrew] and other summer regions – because they were studying nature, not just going to dances at the yacht club. That said, I wonder about the relationship between the elite nature of the professorial Madawaska Club and the substantial government concern in Great Lakes fish stocks (especially whitefish) in the years before and after the Club’s founding. (It’s hard to think about environment, science, and Canada these days without also thinking ruefully about the political climate in which science is practiced.) There are lengthy commission inquiries which include the kind of localized knowledge (and industrial/recreational blamefests) that Club members could contribute to – with the striking exception of any aboriginal knowledge, only observations of aboriginal fishing. But presumably this was the kind of respectable science that the Dominion and Ontario governments preferred to have. This also reminds me of oral histories from alumni of Camp Hurontario, just up the shore from Go-Home, who remembered collecting and tagging fish, birds, and snakes for the DOE and others. ‘Citizen science’ at national parks today fills much the same function: a bit of data-collection, a bit of good PR. The other reason that Go-Home becomes famous is as an early site for painting by Tom Thomson and members-to-be of the Group of Seven. I wonder about any relationship between the art and science of understanding nature, within the Club or their southern Ontario networks. Sorry, a bit all over the map – but I really like the synthetic quality to your approach. We have a lot of place biographies in environmental history; we need more work knitting together the experiences and knowledges from discrete places into historical patterns. This is a great post! I found it fascinating for both personal and professional reasons. My great great grandfather, John Fletcher, was actually one of the founding members of the Madawaska Club. Fletcher was a philosophy professor so didn’t have a role in the research station, but he certainly got into the leisure side of things. Fletcher built a cottage in 1899, and his children built several more around Go Home over the next two generations. The original 1899 cottage now belongs to my parents. Go Home actually entered into my doctoral research on Muskoka in a couple of interesting ways. Go Home Bay is the mouth of the Musquash River, one of two outlets to Georgian Bay of the waters that originate in Algonquin Park and flow through Muskoka (the other is the Moon River). In my dissertation, I treat Go Home as the western most edge of a large bioregion centred on the Muskoka River watershed. I didn’t explore the role of scientific research, but reading through your post has me thinking more about the many layers of history at Go Home. In addition to all the ways that Go Home fits into the narrative of imagining Georgian Bay, which Claire Campbell talks about in her book Shaped by the West Wind, Go Home also served as a portal to and from Muskoka (Georgian Bay folks never like to admit their close connections with Muskoka – sorry Claire). I hadn’t known that the land for the Madawaska Club had been purchased from the DIA, but Go Home certainly was an important site for the Chippewa of Beausoleil First Nation. My relatives can remember finding stone fishing spear heads in the vicinity of the cottage. Beausoleil band members would have spent time each spring and fall at sites around Go Home making use of the fish runs. From Go Home, band members continued upstream to hunting territories in Muskoka and what became Algonquin Park. And I was interested to learn that cottagers at Go Home sought to prevent band members from visiting to sell crafts, since this practice continued for at least another two or three decades further upstream in Muskoka. There’s much more to this story, and I’m intrigued. Finally, I would point out that the name ‘Go Home’ is a product of its Muskoka connections. Decades before the Madawaska Club and the research station, log drivers brought massive pine logs downstream from Muskoka to mills along Georgian Bay. Once the logs had been delivered, these men would ‘go home.’ One mill, Muskoka Mills, just south of Go Home on the Gibson River, cut 8.5 million board feet in 1871. A few years later, in 1875, the federal government fined the company for allowing sawdust to harm fish habitat. I started to tease out some of these connections in 2011 when Jim Clifford and I canoed from Muskoka to Go Home. I planned on making a two-part mini-documentary about our trip and all the history that connects Muskoka and Go Home. I only managed to get the first part done… Your post has inspired me to get the second part made! Thanks for these comments and observations. Claire, the question of how science may have contributed to Go Home Bay’s “authenticity” would be a fascinating one to pursue. I wonder if cottagers ever used the station to mount nature-study programs for the children who spent summers there? Andrew, with whom I’ve been discussing the Madawaska Club over the last several weeks, might have some sources on this! I think the cottagers welcomed the crafts — just not the annual incursion of bodies… This sketch just scratches the surface and requires more research, and more sources. And Andrew, if Jim isn’t available, then maybe I could sit in the bow seat for part two of the journey, which you should definitely complete.